Shop anytime online at our Book Fair Webpage! You are invited to our Scholastic Book Fair, a reading event packed with excitement for students and families. The Celeste High School Beta Club is sponsoring this event to help raise money for Beta Club scholarships that are given out during high school graduation. 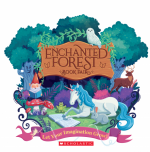 Our Book Fair theme for fall 2018 is Enchanted Forest: Let Your Imagination Grow! Mark your calendar for our Book Fair Family Event on Mon. Nov. 12th from 5:30-8:00pm! Shop our fair and enjoy cake and punch, pictures with Clifford the Big Red Dog and story time! We encourage you to wear costumes to family night, so dress like a fairy tale character, unicorn or gnome. Door prizes (books/posters) every half hour! Attached is a copy of the Book Fair list. It highlights some of the books featured at the fair. You can make your selections in person or you may complete the order form on the back of your booklist and send it to school with your child. If you’re all booked up during Book Fair week be sure to visit the Book Fair online at www.scholastic.com/fair. Our Online Fair is available for an extended time from Nov. 16th to Nov 24th. Before you visit the Book Fair, be sure to download the Book Fairs app to help you find the right books for your child. For more information, visit: scholastic.com/apps/bookfairs. Dress an enchanted forest character!